Kieffer Moore was on target. 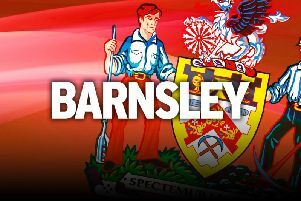 Daniel Stendel felt Barnsley showed an important trait in winning ugly against Rochdale. The Tykes had it all to do when Ian Henderson fired relegation-threatened Dale into a 49th-minute lead at Oakwell. But they responded in emphatic fashion to turn the game around and claim an important 2-1 victory. Kieffer Moore equalised with his 16th goal of the season six minutes later before Cauley Woodrow struck for the ninth time this campaign to seal the three points. The win moved the Reds into third position in the League One table, just two points off the automatic-promotion spots. And Stendel, who lost assistant head coach Andreas Winkler to Huddersfield earlier this week, believes the way his side ground out the win will stand them in good stead for the remainder of their promotion push. The German said: “Today was not our best game but it was an important win. “When you look at the table, the important thing was the three points and that is the main point for me today. “I think that the mentality was good from every player on the pitch today, but when there’s a lack of concentration it is not too easy against a team like Rochdale at the bottom of the table. Stendel also praised the impact of goalscorers Moore and Woodrow, insisting the pair’s quality will be invaluable in tight games. Moore had a goal ruled out for offside shortly after the break, but soon cancelled out Henderson’s opener with a drilled shot into the bottom corner from outside the box. Woodrow then got the winner in the 75th minute after Jacob Brown beat his man and squared the ball to the former Fulham striker, who made no mistake from six yards. “The two goals from Cauley and Kieffer was the type of quality we need, especially today when we didn’t play well,” Stendel said.